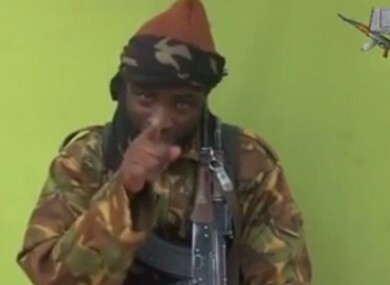 Boko Haram leader appears on video released yesterday. Yesterday, the Lagos Government dismissed a prisoner-swap offer from the Boko Haram kidnappers. “We have shared commercial satellite imagery with the Nigerians and are flying manned ISR (intelligence, surveillance and reconnaissance) assets over Nigeria with the government’s permission,” a senior US administration official said. The official declined to be named, and it was not immediately clear what kind of aircraft were being deployed, nor where they were based. Boko Haram’s leader said in a new video released yesterday that the abducted schoolgirls would only be released if the government freed militant fighters from custody. Abubakar Shekau made the claim in a 27-minute video, which apparently showed about 130 of the girls who were kidnapped from their school in the remote northeastern town of Chibok nearly a month ago. The militant leader said the girls in the video had converted to Islam and all were shown in Muslim dress, reciting the first chapter of the Koran and praying at an undisclosed location. Their disappearance has triggered global outrage, in part due to a social media campaign that has won the support of high-profile figures including US First Lady Michelle Obama and Pope Francis. Nigeria’s government has been criticised for its slow response to the kidnapping, but has been forced into action as a result of international pressure. French President Francois Hollande has also called for a west Africa security summit to discuss the Boko Haram threat, which could be held as early as Saturday.The United States and Britain have been invited, he said. The latest footage shows the girls in black and grey full-length hijabs, sitting on scrubland near trees. Three of them are shown being interviewed — two said they were Christian and had converted while one said she was Muslim. All three pronounced their belief in Islam dispassionately to the camera, sometimes looking down at the ground and apparently under duress. Most of the group behind them were seated cross-legged on the ground. The girls appeared calm and one said they had not been harmed. There was no indication of when the video was taken, although the quality is better than on previous occasions and at one point an armed man is seen in shot with a hand-held video camera. Shekau does not appear in the same scene. Instead, he is seen dressed in combat fatigues, carrying an automatic weapon in front of a lime-green canvas backdrop. ‘We have liberated them,’ he said. Email “US flying 'manned missions' in search of abducted Nigeria girls”. Feedback on “US flying 'manned missions' in search of abducted Nigeria girls”.